The Palermo Junction or “Nodo di Palermo” refers to the double electrified track connection of Palermo city with the international civil airport “Falcone e Borsellino” in Punta Raisi, Italy. Trevi SpA have been involved in the construction of a fast city mobility system which aims to prevent decongestion whilst improving connections between local regions and permeability among areas adjacent to the local railway line. The planed layout is made of 19.5 km of railway embankment/cutting; 0.5 km of viaducts, bridges, underpasses, overpasses; six natural tunnels with a total length of 3.2 km; 18 artificial tunnels with a total length of 5.2 km; about 2.8 km of stations/stops inside tunnels or in the open air. 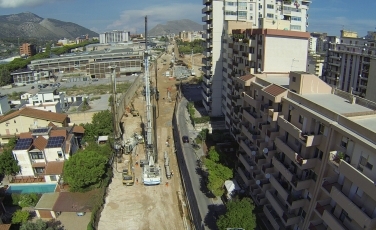 The Trevi team will carry out various types of work; CSP piles with a diameter of 920 mm and approximately 200,000 secant piles have been carried out. In addition, tunnel consolidation works includes the execution of jet-grouting columns, grouting works from the vault and the tunnel opening and the execution of metal forepilings around the vault. About 7,000 lm of micropiles with a diameter of 300 mm have also been carried out. They have been reinforced with an iron pipe having a diameter of 244 m and three drilling units in double shifts are employed. Moreover, by 2016, the execution of the works for the Lazio station will be carried out with works covering CSP piles, diaphragm walls with hydromill and jet grouted bottom plugs. The project is expected to be complete towards the end of 2016.